Goodbye winter, spring is here! I always look forward to the joy spring brings: birds chirping, flowers blooming, warmer temperatures, more daylight, more sunshine, and more energy. Some of the rites of spring are clean-up and rejuvenation. This past week I’ve been working on a huge spring cleaning project, cleaning out my sewing room. I removed most of the items that I reasonably could to get them out of the way. Then a friend came over to help with vacuuming, dusting, and washing the single south-facing window. It only took one hour. Now everything is bright, clean, and reorganized. I feel like there is a breath of new life in my sewing room and I am reinvigorated and ready to start some spring sewing. 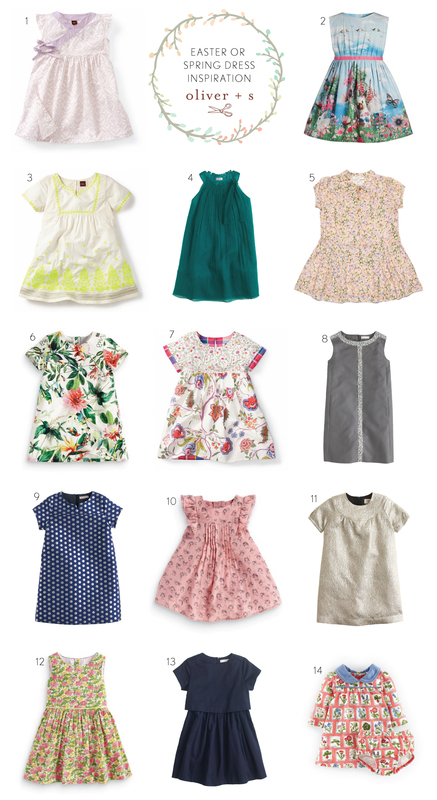 I’ve got my mind on at least a couple of pretty spring dresses to sew. There are quite a few spring events that a new dress can be made for. Easter will be here before we know it. You can get the girls in your life set for the Easter bunny visit with some new Sunday best. Mother’s Day (in the US) is the second Sunday in May. How about a new dress for a Mother’s Day brunch at a nice restaurant? Or maybe you need to sew something suitable for a spring wedding? Here are over a dozen dress ideas to help you catch spring fever to make unique one-of-a-kind hand made dresses. Enjoy! 1. Make a Library Dress like this sweet wrap-styled dress in a lovely lavender which is such a popular springtime color. Pair it with some cute matching t-bar shoes and an Easter hat or bonnet. 2. Sew a Roller Skate Dress in a playful border fabric similar to this super fun dress. She’ll love wearing this for whatever celebration is in store for the day! 3. How about a Hide-and-Seek Dress in yellow? It’s such a classic springtime color. 4. She will be so in style with this bright, eye catching solid colored garment. I think the Badminton Dress would be a good one to use to recreate this frock. 5. Try turning the Music Class Blouse into a dress in a small floral print in pastel colors for a softer, understated look. 6. There sure is a lot of flower power in this a-line dress! Try using the Pinwheel pattern for a similar look. 7. Have fun mixing small and large scale floral prints for a Playtime Dress. 8. This one would be gorgeous for a nighttime spring wedding. Create a fancy School Photo Dress by adding a little bling. 9. This metallic polka-dot dress is spot-on for all spring parties. Recreate it with the Ice Cream Dress, of course! 10. Keep it classic with a gorgeous dress in pastel colors. A timeless look for Easter, pastels exude plenty of vibrancy. Maybe use the Family Reunion pattern? 11. This fun frock would be perfect for a wedding or Mother’s day brunch at a fancy restaurant. Make it by using some amazing fabric and turning the Class Picnic Top into a dress. 12. What would spring be without pretty florals? Create a Fairy Tale Dress inspired by this vintage-style dress. 13. Most of the time, Easter egg hunts are held outdoors, so have the kids dress for the weather. And what would be better than this outfit for that event since it’s so comfortable and allows girls to move freely. You can use the Lunch Box Tee + Culottes pattern to recreate it. 14. Stitch a Puppet Show Dress to make her outfit as pretty as an Easter egg like this super cute one! It would be perfect for portraits taken on a visit with the Easter bunny. Love Love Love all the fabric choices and variations to the patterns. Gives me lots of ideas beyond ric rac and lace trim. Ooooh! I think I’m going to try #5! Audrey, I hope you’ll show us when you’re done! Crystal, that’s amazing that you could tell! You must know our patterns very well. Kudos! Why can’t you make the Fairy Tale Dress in size 10? Its so sweet and I’d love to make it for my granddaughter but she wears a size 10! Patricia, I’m not sure what you mean. The Fairy Tale Dress is available through size 12, as are most of our patterns. So you CAN make it in size 10!